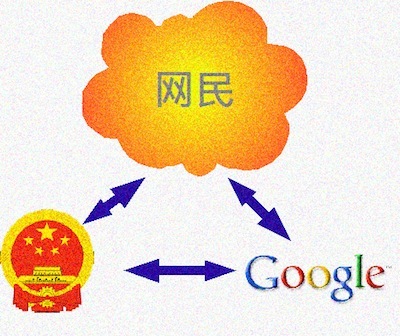 Chinese netizens have published an open letter to "relevant Chinese government ministries" and Google complaining about the lack of transparency of Chinese government censorship and Google's implementation of Chinese government censorship policies. How was the censorship decided for topics such as mining disasters, the brick kiln slave children, Yilishen, violent evictions, Sanlu milk powder, Deng Yujiao, the governor's confiscation of a journalist's recorder, the Shanxi vaccine scandal, and other incidents? When it comes to activities by government leaders and ministries that violate the constitution and the laws beneath it, is it necessary to carry out unconstitutional censorship? [Censorship by Google] should be based on clear laws, the related regulations and censorship procedures should not violate China's constitution and laws. Vague censorship standards result in over-censorship or make it impossible to self-censor. Pre-censorship should not be carried out, as the right to free expression as guaranteed by the Chinese constitution and laws must not be violated. It was quite simple. All that was needed was an unending series of victories over your own memory. "Reality control," they called it; in Newspeak, "doublethink." Winston sank his arms to his sides and slowly refilled his lungs with air. His mind slid away into the labyrinthine world of doublethink. To know and not to know, to be conscious of complete truthfulness while telling carefully constructed lies, to hold simultaneously two opinions which cancelled out, knowing them to be contradictory and believing in both of them, to use logic against logic... to believe that democracy was impossible and that the Party was the guardian of democracy... Even to understand the word "doublethink" involved the use of doublethink.